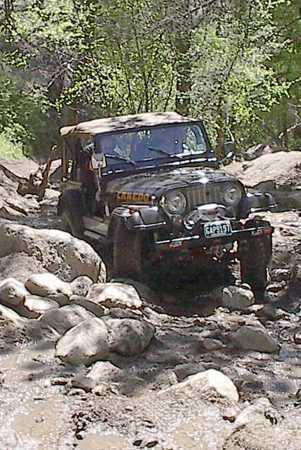 On Sunday, June 2nd 2002, the HoboJeepers consisting of Hobos: 'The Toolman' (Ken Kordes-CJ5), 'Weiszguy' (Paul Weisz-CJ7 & son Brett-'Weiszdude'), the 'Colonel' (Chris Potter-CJ7 & son Jason), with his guests Bill Rainbolt & his daughter Amy, and myself 'MadMax' (Scott Maxwell-TJ with my sons Tom and Pete) departed for Carnage Canyon up near Left Hand OHV. At a quick gas stop in Boulder we ran into the forest ranger that helped with the Left Hand Canyon clean-up over the last several years. We stopped and talked to her for a little while. She was in search of enough water to float a kayak, but was having some difficulty there. From there, up to the Carnage trailhead we went. Carnage is a great little trip that took us about 3 hours to run. 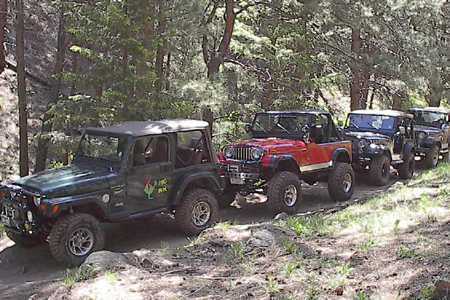 A little way up the canyon we ran into three fairly stock TJ's. One was hung up on some rocks and his buddy strapped him off. As they let us by they asked what trail they were on in that they wanted to make sure they avoided Carnage Canyon. 'Ooops, too late'. Needless to say they turned around and headed back down. We also had three full size blazers behind us. 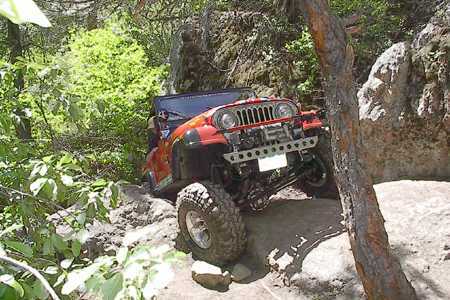 Carnage is a real blast, with obstacles the entire way up the trail. In some places the combination of water and the lose dirt/big rocks made minor obstacles a lot more challenging then normal. This is no place for rigs with open diffs and no lift kits. Most of the major obstacles had go-arounds though. 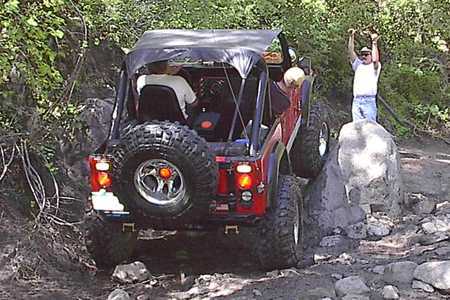 We all successfully navigated thru the 'squeeze' obstacle up Carnage Canyon. 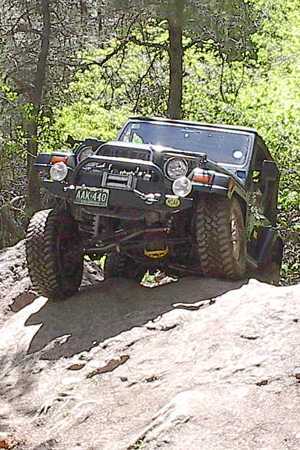 Paul tried a more difficult line to the left, but the steepness of the two boulders involved kept forcing him back to left boulder, and a little rocker panel action even on the highly lifted jeep running 35's was in order. Paul decided that until he got his new sliders installed the best route (least damaging) would be the left side where the rest of the gang headed. This was the last we saw of the full size Blazers, so don't know if they made it through here or not. There were a bunch of great obstacles the rest of the way up. Some were bigger rocks requiring the correct approach. Others were 'rock strewn' sections that required picking your line in advance, and then navigating by 'memory and feel' as you got into the rocks. A little spotting from fellow Hobos helped as well. Tom (my son), was the designated photographer and was clicking pics as we progressed up the canyon. Once up in the saddle at the top where the road runs into Left Hand Canyon we stopped for lunch. From there, Paul led us down through the playground and on to a 'dump bump' style obstacle he and Hobo Jed had played on before. It sure was nice to have the tip over section blasted out, safety over challenge. 'Thanks' to who ever did all that hard work. As the Colonel was attempting the dump bump he caught a bounce or two and when coming down busted a front knuckle. Good thing we were close to the exit at this point. After airing up from Paul's compressor we headed back to town after a great morning of camaraderie and wheelin'. Once I got home, the faithful trip leader rushed to get the pictures developed to make the newsletter. And what did he find? No film in the camera. No problem, Tom and Pete whipped out some photos from memory. Who says you need a fancy camera to take great pictures. Thanks Tom and Pete for the "photos". Later of course only to find out the scanned drawings were too big to download. Oh well, at least the Jeep didn't break down. *Had a fun day..... Thanks to Scott, Ken and Paul and company..... My first time up Carnage and I thought it was a fun and challenging trail, tough in some spots and a lot of them. 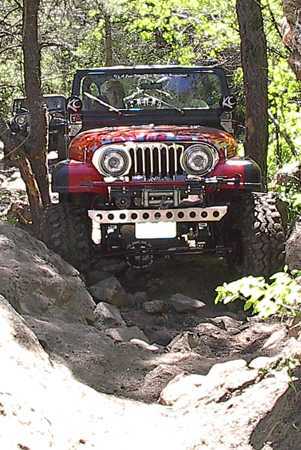 Unfortunately on the very last obstacle of the day in the "play area" of the Left Hand Canyon, I broke a front axle (passenger side knuckle)....Opps..... I started tearing it down when I got home and will get it pulled out in the next day or two. I may go ahead a do some upgrading/part replacement while I have the axle/wheel components apart.